In a four-page letter (PDF) sent to Transportation Commmissioner Chloe Eudaly yesterday, Portland Business Alliance President and CEO Andrew Hoan offered carefully mixed doses of support and opposition to projects included in the City of Portland’s Central City in Motion (CCIM) plan. 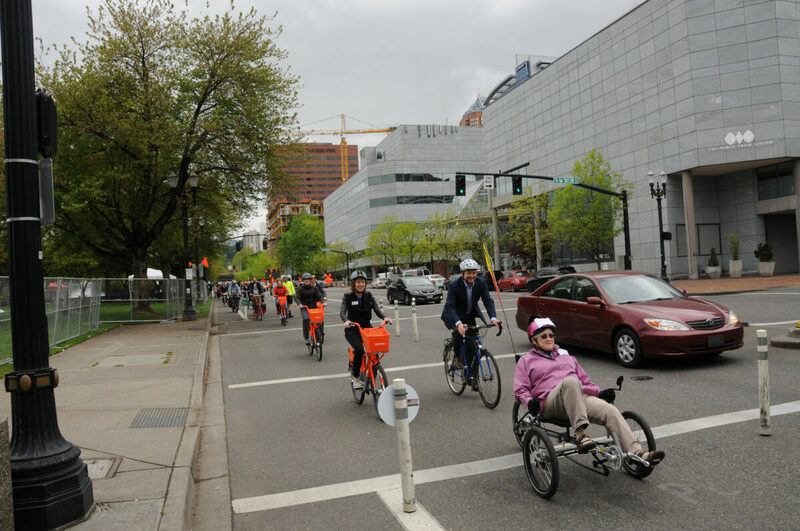 And in a surprising show of dealmaking, Hoan offered up enthusiastic support for a carfree transit mall in exchange for the City’s proposal to add protected bike lanes to SW Broadway and 4th. 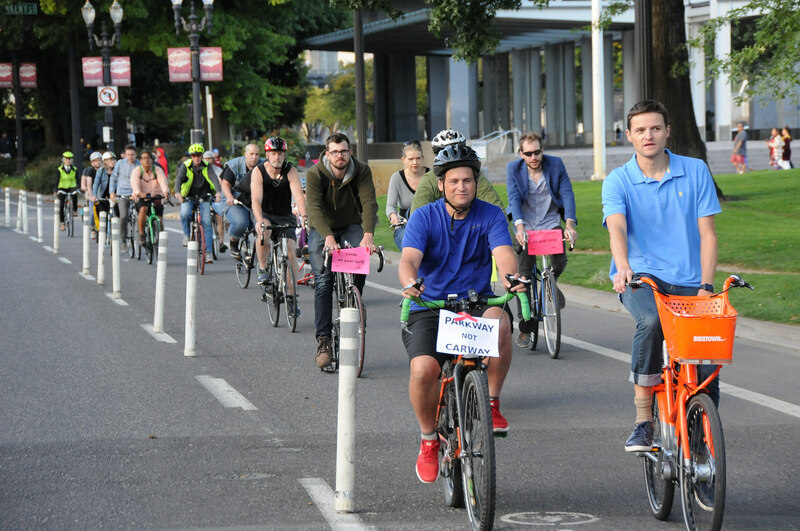 And instead of using one lane of Naito Parkway for a protected bike lane, the PBA says they’ll support a new bike path that would bisect the iconic Waterfront Park. Neither of those ideas has been seriously considered in the past two years of discussions about this plan. With less than a month before the groundbreaking investment in central city streets is scheduled for its first hearing at City Council, many project-watchers have been waiting to see where the PBA stands on the proposals. The organization represents 1,900 businesses and has a history of outsized influence at PBOT and City Hall. It was hard not to feel a wave of optimism about biking in Portland after talking with so many people who wanted to support this project. This is the latest installment of our Adventures in Activism column, written by Catie Gould and Emily Guise. The protected route has become a lifeline for many Portlanders. The Portland Bureau of Transportation announced today that Better Naito will come to an early close this year. The city will take down the plastic wands and signs and remove the pavement markings on the weekend of September 22-23rd — one week before it was scheduled to end. It’s time to talk about the future of Better Naito. 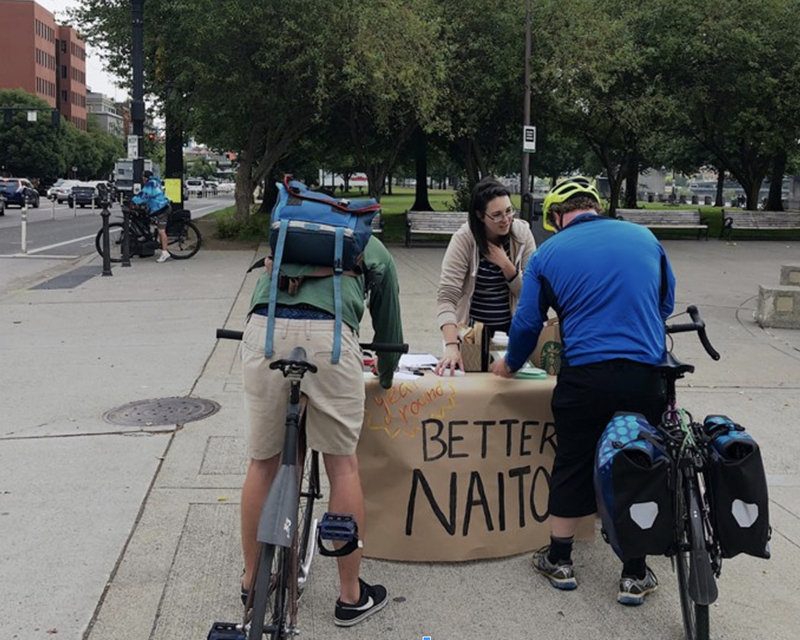 Now in its fourth year as a seasonal street oasis for vulnerable road users, the talks about making Better Naito permanent are heating up. This past winter, the Portland Bureau of Transportation commissioned a private consulting firm to develop a report (below) with conceptual designs for a capital project that would replace the temporary plastic delineator wands and paint striping that exist today on Naito Parkway’s northbound lanes from SW Main to NW Couch with a permanent, 20-foot wide path for bicycling, walking, and other uses. Ceremonial parade loop on Better Naito this morning. 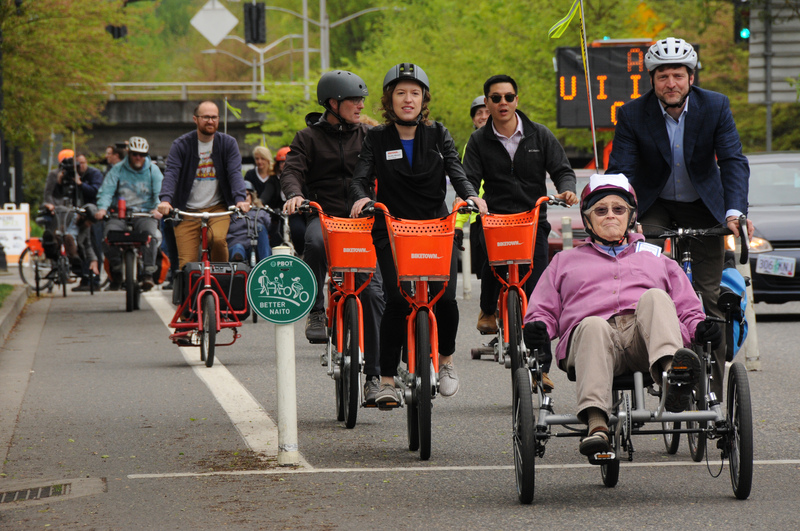 With those words by Biketown General Manager Dorothy Mitchell, the City of Portland officially opened Better Naito this morning. 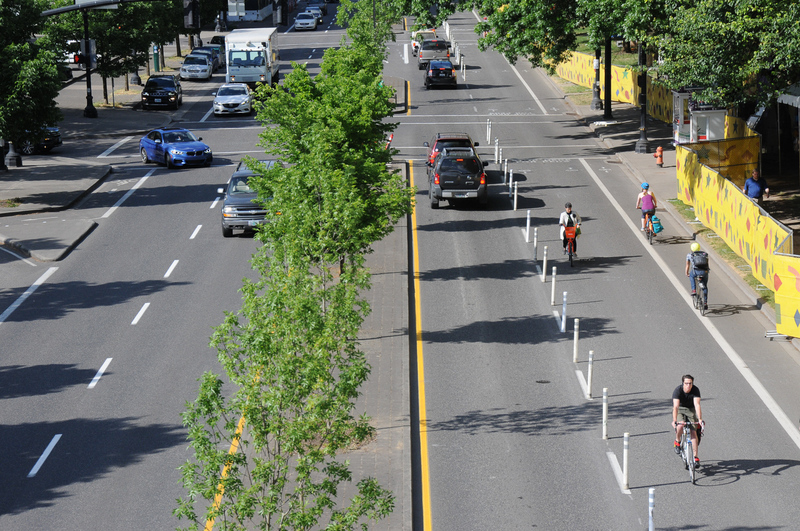 From now until the end of September, Naito Parkway will have more room for biking, walking and rolling between the Hawthorne and Steel Bridges. 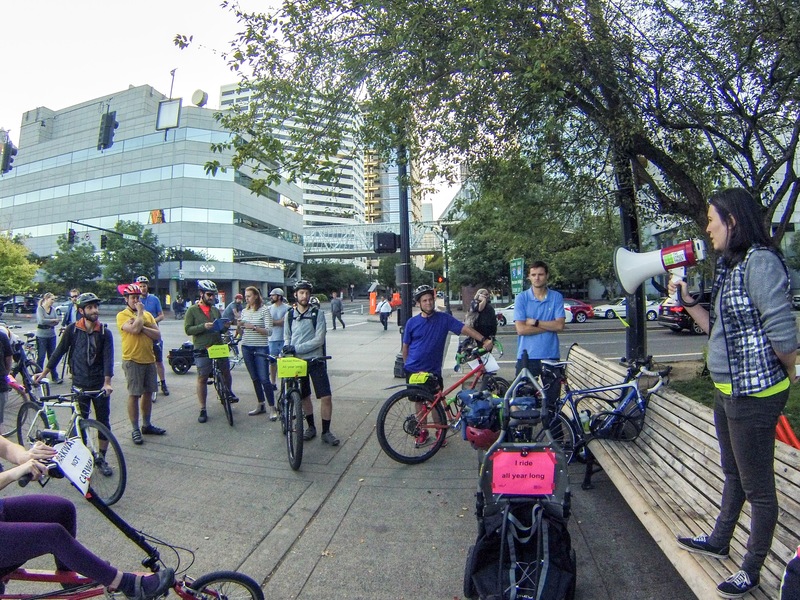 The re-allocation of road space was first made possible in 2015 by a group of volunteer activists from Better Block PDX in collaboration with planning students from Portland State University. Last year the project was taken over by the Portland Bureau of Transportation and they’ve now budgeted for a seasonal installation for the next four years. 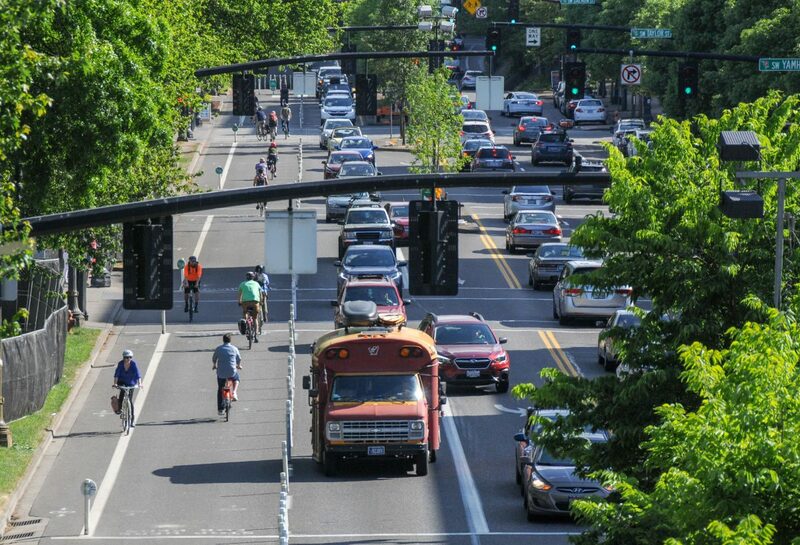 Last year PBOT counted 500,000 trips in the Better Naito lane and it has been widely hailed as a success.